group known as *Citizens for Intelligent Planning hopes to stop such a building from being built. the first downtown office tower built within a dozen years. The massing of the proposed design develops from a series of simple steps that relate directly to the physical context and program. The building is set back from Greenwich Street to create a landscaped plaza for the development, the adjacent College of Insurance and the neighborhood. The establishment of this open space is central to the integration of this project into the surrounding context. Like the open spaces to the north at Salomon Smith Barney, the gardens of Independence Plaza, Washington Market Park, and the playground at PS234, the proposed plaza adds another link to the emerald necklace that the "Greening of Greenwich" plan promises. It also may recall the "pleasure garden" formerly near the site. To the west of this plaza, the massing of the project develops around a folding masonry form that addresses the two different scales of the context. This form begins its three-dimensional movement along the north side of the site and climbs vertically to clearly define a pedestrian-scaled masonry street wall along Warren Street. The height and material of this street wall relates directly to the scale and materials of its neighbors to the north and east. Folding to the south, the masonry form defines a podium for the tower above before it again climbs vertically along the south side of the site to the highest point in the massing. The larger scale of this southern face addresses the scale of the financial district and also creates a kind of "bookend" or complimentary bracket to the massing of Salomon Smith Barney to the north. Around this masonry form are three distinct glass volumes. The first two volumes nestle under the masonry form and relate directly to their programs. At the southern edge of the site and at grade, a glass enclosed office lobby extends through the project and links Greenwich and West Street. This through block lobby reestablishes the strong east/west organization of the site present when the first piers extended into the Hudson from this location. The eastern end of the lobby extends out towards the plaza to create a clear entry and its chamfered end responds directly to the angle of Greenwich Street. To the north of this lobby, the second glass volume contains street level commercial space accessible from West and Warren Street as well as from the entrance plaza. The third glass volume is placed above and north of the folding masonry form. The relationship between this volume and the masonry form is critical for two reasons. First, the taller and more solid masonry form acts as a passive solar screen for the glass volume. Shaded by the more solid masonry form, the glass volume can be very transparent, optimizing the quality of light inside and presenting an open, delicate "picture window" to the north. Second, by shifting the glass volume to the west, stepping profiles are created on the east and west faces of the tower that directly correspond to the angles of West and Greenwich Streets. With its northern and southern faces assuming the geometry of the dominant city grid and the stepping profiles of the eastern and western faces responding to the rotated grid sponsored by the Hudson, the tower is a direct manifestation and resolution of the complex grids that overlap the site. The building is set back from Greenwich Street to create a landscaped plaza for the development. To the west of the plaza, the massing of the project develops around a folding masonry form that addresses the two different scales of the design. This form begins its three-dimensional movement along the north side of the site and climbs vertically to clearly define a pedestrian-scaled masonry street wall along Warren Street. Around this masonry form are three distinct glass volumes. At the southern edge of the site and at grade, a glass enclosed office lobby extends through the project and links Greenwich and West Street. To the north of this lobby, the second glass volume contains street level commercial space accessible from West and Warren Street as well as from the entrance plaza. The third glass volume is placed above and north of the folding masonry form. The relationship between this volume and the masonry form is critical for two reasons. First, the taller and more solid masonry form acts as a passive solar screen for the glass volume. Second, by shifting the glass volume to the west, stepping profiles are created on the east and west faces of the tower that directly correspond to the angles of West and Greenwich Streets. 270 Greenwich will be erected on this parking lot. The view on 22 June 2002 from the corner of Greenwich and Warren Streets, with the 4 World Financial Center beyond. A stretch of cobblestone Washington Street divides the lot of 270 Greenwich. 101 Barclay building is across the Murray Street. As I remember there were not alot of fans of this building on this forum, but I still like it. Has anyone heard anything on this, has it been cancelled? I believe it's been cancelled, or will be cancelled shortly. They are considering a taller residential building on that site now. I say good riddance. It was typical SOM blah. "Salomon Smith Barney Building?" 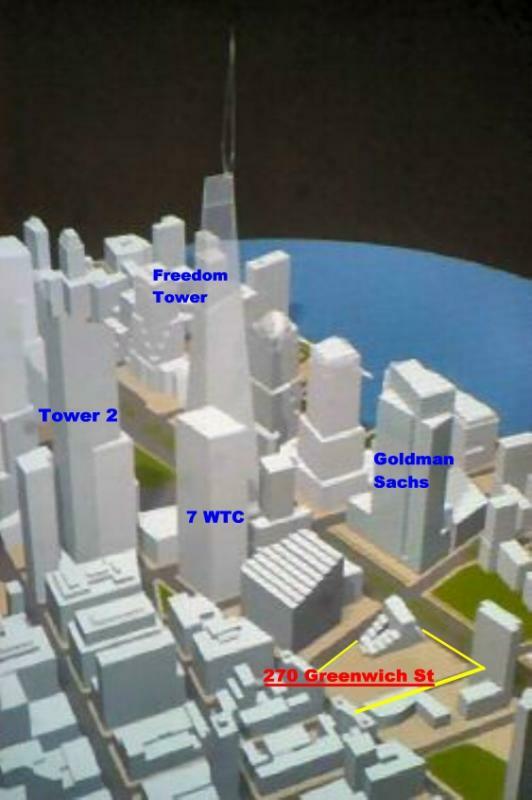 Are they referring to 7 WTC? I can tell you that Jersey City is not the Financial Capital of the world. "Lower Manhattan is no longer the Finacial Capital of the World, that title is now Jersey City"
Actually...you're both wrong. Bear, Morgan Stanley and Goldman (an seon, BNY) all have their back offices in, or around, Metro Tech, in Brooklyn. JC is home to Pershing and Lord Abbott. The world's largest trading floor is up in Stamford, and it belongs to UBS. 7 WTC was *all* asset management. There are more employees of the NYC financial industry than there are residents of Jersey City. I actually like the contrast of the black and clear glass. It's not that bad. Substitute London for Jersey City, and at least the debate would be credible. JC is the financial capital of NJ.